Cat on a Hot Tin Roof (1958), starring Paul Newman and Elizabeth Taylor, is one of the 1001 classic movies you should see. Each Monday, I'm going to recommend a classic movie you should see (for the reasons behind the 1001 series and reviews of earlier films covered go here). October's selections will focus on felines in film. This week's movie is the screen adaptation of Tennessee William's Pulitzer Prize-winning play, Cat on a Hot Tin Roof (1958). Cat on a Hot Tin Roof begins when the Politt family gather at their Mississippi plantation to celebrate patriarch Big Daddy's 65th birthday. However, the Politt's have anything but a happy reunion. Big Daddy (Burl Ives) is diagnosed with inoperable cancer while his eldest son, Gooper (Jack Carson), and Gooper's wife (Madeleine Sherwood) scheme to get the inheritance. Meanwhile, younger son, Brick (Paul Newman), ignores his beautiful wife, Maggie (Elizabeth Taylor), in favor of alcohol and memories of his beloved best friend Skipper who committed suicide. Williams' dysfunctional family drama was a Broadway sensation, but several Hollywood studios turned a film adaptation down because the play's homosexual themes were not acceptable under the Motion Picture Production Code. Finally, MGM took the project on as a vehicle for its top star Grace Kelly, although the part was recast with Taylor after Grace married Prince Rainier of Monaco. The result was a much watered down version of the play (Williams was reportedly livid) that was one of the top box-office hits of 1958. 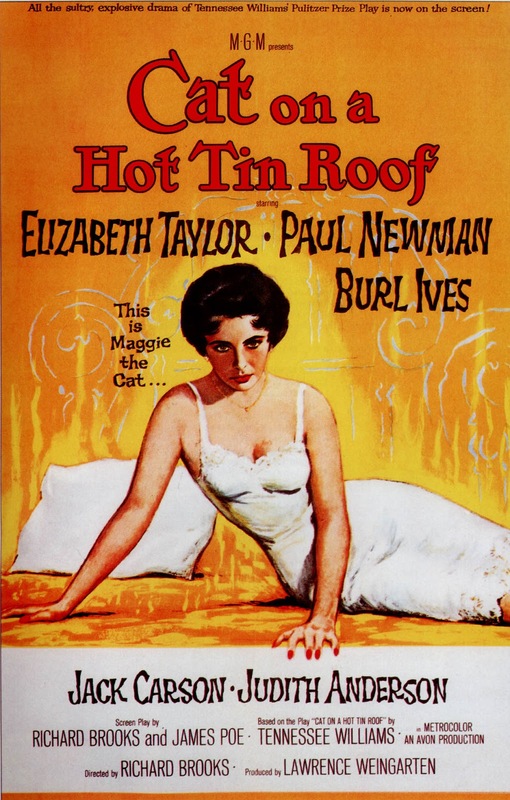 Cat on a Hot Tin Roof is filled with great performances -- Newman gives a devastating portrait of alcoholism and Ives magnificently recreates his stage performance as the blustery Big Daddy -- but even surrounded by those great actors, Taylor steals the show as the frustrated Maggie "the cat." She looks amazing of course -- it's no accident that most of the movie's advertising features Taylor in a negligee -- but her performance, as a woman driven to desperation by her husband's indifference, is even more impressive. 1. Homosexuality. MGM extensively revised the play to remove a relationship between Brick and Skipper, which makes the motives for Brick's alcoholic binge and Maggie's jealously somewhat confusing to modern viewers. 2. Casting. MGM originally cast Grace Kelly and James Dean as Maggie and Brick, but those plans changed after Kelly's marriage and Dean's fatal car accident. While Kelly could have given an interesting performance (her Maggie would have probably traded Taylor's fire for more emotional vulnerability), I think Newman gives a more mature and controlled performance than Dean would have been capable of at the time. 3. Mike Todd. Taylor's third husband was killed in a plane crash a few weeks after the movie began shooting. Taylor, ever the trouper, carried on despite her grief. 4 Dialogue. MGM did preserve a lot of Williams' crackling dialogue. Especially memorable are Big Daddy's rants about "hypocrisy (Ives pronounces it "high-pocrisy") and mendacity" and Maggie's hilarious, but accurate references to Gooper's brood of children as "no-neck monsters." 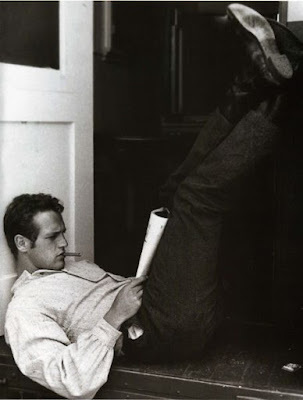 Paul Newman studies the script for Cat on a Hot Tin Roof (1958). Other critics: Cat on a Hot Tin Roof has a 97 percent fresh rating at Rotten Tomatoes and Leonard Maltin writes that "Tennessee Williams classic study of 'mendacity' comes to the screen somewhat laundered but still packing an emotional wallop" in a three and one-half star review for his Classic Movie Guide. 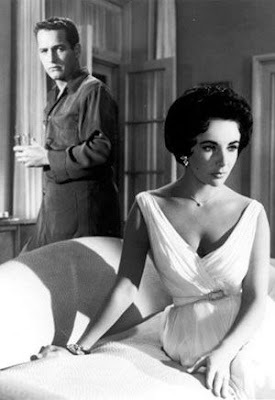 Critics in 1958 were generally favorable with Variety writing that Cat on a Hot Tin Roof was "an intense, important motion picture" while The New York Times critic Bosley Crowther was in a moralizing mood. He wrote "what a pack of trashy people these accomplished actors perform! Such a lot of gross and greedy characters haven't gone past since Lillian Hellman's The Little Foxes went that way. The whole time is spent by them in wrangling over a dying man's anticipated estate or telling one another quite frankly what sort of so-and-so's they think the others are." The bottom line: Cat on a Hot Tin Roof may be watered down but it is still an extremely effective portrait of greed and mendacity in American life. Watch it for the crackling dialogue and sensational performances from the entire cast. Availability: Cat on a Hot Tin Roof is available on DVD, Blu-ray, and video on demand. Next week, I'll continue the theme of felines in film with Cary Grant as a reformed cat burglar in director Alfred Hitchcock's romantic thriller, To Catch a Thief (1955). I'll be participating in the Classic Movie Blog Association's fall blogathon on Monday, so this article will be published on Wednesday. One of my favorite movies! I cannot imagine James Dean as Brick. And though Grace could have pulled off Maggie, I can't imagine a better performance than Elizabeth Taylor's. In fact, I think it is Liz's best acting job. I agree about Elizabeth Taylor. She proved her acting chops by pulling off a great performance among so many acting heavyweights and in difficult circumstances.